Located on the west side of the island, the villa is located less than 550 metres away from one of the most famous and beautiful beaches of the island, Cala Conta. This stretch of coastline, idyllic and beautiful, pearly is characterized by fine sand and crystal clear waters and sandy bottom, perfect for diving. Within 700 meters from the house, right at the end of the dirty road taking to Calaconta Beach there are 3 restaurants all overlooking the water. The property is 5 minutes to the Calabassa beach Club with its very funky beach club and 3 different restaurants. 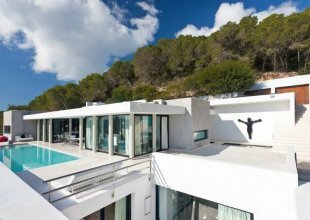 Can Dos Rocas is a spectacular five-bedroom villa situated in Ibiza. This formidable residence, optimized for comfort and magnificently luxurious space, helps to redefine the term ‘luxury’ and is preeminently placed within a new, exclusive and gated compound in exclusive Cala Conta, on the island’s beautiful West coast. From the mansion there is a magnificent sea view and the villa is excellently sited to present a sweeping panorama that includes the islands of S’illa des Bosc and Conejera, as well as the famous Balearic sunset. Everything is carefully considered and all is designed for immediate comfort, while cutting edge technology will make any stay here all that more special. Glazed walls seamlessly merge the expansive living areas and outdoor spaces, which are geometrically defined and pleasantly arranged along with the paved stone pathways dissecting the sprawling well-tended lawns. The property is neither overlooked nor has any obstructed views. There is a long and lean long swimming pool, bordered and shaded to one side by high trees and enticingly placed at one end is wide sun terrace offering a superb panorama of landscape and sea views. The villa features 5 bedrooms which can be made up as twin or doubles with zip and link beds, all ensuite with Dornbarcht Sky rain showers & stand-alone tubs. TV + Apple TV, iPads, Crestron sound system. Bedrooms are over 30 sqm on ground floor and approx 18 sqm on lower ground floor.